Where do babies come from? They’re delivered by Storks of course; or were, before the storks got out of the tricky baby business to deliver packages for cornerstore.com instead. After all, there’s no danger of becoming overly attached, or of having your eye poked mid-flight, with electrical products. This is the premise of Warner Animation Group’s new release: Storks, where top employee Junior (Andy Samberg) is on the verge of becoming boss … as long as there is no ‘monumental catastrophe’ by Monday. This, of course, leads to a growing state of catastrophe, and an unexpected letter leads Junior into a madcap mission with ‘the orphan Tulip’ (Katie Crown) to deliver one more baby to its family before anyone notices. Playing on such a classic notion leaves plenty of room for creativity. The old baby factory, along with many of the film’s visuals, are a thing of beauty, and the age-old question of how babies are made is referenced, but not overplayed. Writer/director Nicholas Stoller (Forgetting Sarah Marshall, The Muppets) also provides ample amusement for adults as well as children. In fact, there is an entire sequence about trying to look after a new baby for the first time, which is surely aimed solely at the parents in the audience that have survived this; and the action of the entire film has enough energy and visual interest throughout to keep all ages engaged. The real key, however, is the film’s characterisation. 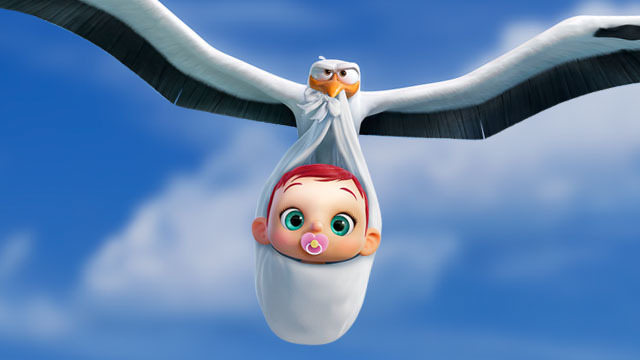 From current CEO Hunter (a deliciously cold Kelsey Grammer) and his explanation of an all-glass office (though birds can’t see glass) as ‘power play’, to the wolf pack’s impeccable team work skills; Storks creates an entire world of brilliant personalities. In fact they do this so effectively with the insufferable ‘Pigeon Toady’, complete with Donald Trump hair and idiotic bravado, that he is as repugnant to the audience as he is to the characters. However, the joyful characterisation is sadly let down when it comes to Tulip, who is a disappointingly stereotypical mix of perky enthusiasm, clumsiness, and wild hair straight out of Brave. Unlike the other characters, Tulip’s wish to look after the baby is frustratingly explained in a montage describing women’s inbuilt biological maternal instinct, which leaves them powerless toward the lure of cuteness, and might as well end with her portrayed as a 1950s housewife. She may be likeable, but we’ve seen her all too many times before. Ultimately with its balance of classic fable, and modern technology obsessed world, Storks puts personal interaction (however uncomfortable) at its centre; creating a thoroughly imperfect, but ultimately loveable romp. They may not fully achieve the Stork motto of ‘always deliver’, but they get there in the end.